Adjust it by your own imagination or according to the latest fashion trends. Anything can look good on it. It is only up to you, what you will do with it. The possibilities have no boundaries. A naked manekeen is waiting for your valuable ideas. Don’t be afraid to be original, playful, courageous and creative. Trim, cut, stick, hatch, collage, draw, print, applicate, decoupage. what is it aimed for? Inspirations can be found on the runway, where uniquely dressed individuals are posing already. The history goes back to the beginning of the 20th century, when the manufactory in Moravia was open to produce travel cases. The cases were exported to various countries around the world. 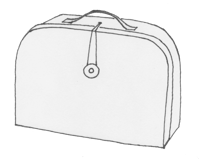 In the 50's the manufactory introduced the famous small paper case for children. It was very typical for the Czech children to use this small paper case for art tools during their early years at school. Some of the schools maintain this tradition to present days. Sometimes you can see these cases with movie characters, too. We decided to simplify this traditional design and decoration to a minimum. The idea was to either keep this simple design or to use future owner's creativity and decorate it.